As you shop for a new home water softener system, you will likely come across a few models made by General Electric. While there is no denying that GE has built a solid reputation when it comes to quality home appliances at affordable prices, they do not make the best water softener systems on the market. That being said, the units that they make are both affordable and high quality. If you’re considering buying one of the GE models for your home or office, let our reviews below help you come to an informed decision. In terms of water softening efficiency, the higher grain unit is the best and the lowest grain unit the worst. That being said, each model is efficient. All of the models have SmartSoft technology and water saving technology. The SmartSoft feature basically just monitors your usage to look for patterns so that you always have soft water available on demand. The units all have a control panel where you can program your preferred settings and a memory feature so that you won’t lose so those settings if the power goes out. You also get to select the level of softness for your water thanks to the Custom Select blending valve on the units. It’s also worth pointing out that each model has a salt-saving feature that actually reduces the amount of salt used compared to similar models by other brands. This is a good way to keep your costs down. Additionally, the digital control panel lets you know how many days you have left on the current salt supply. This is important because it means that you don’t have to worry about the re-appearance of hard water as long as you keep a check on that control panel display. Then, you can refill the unit with salt right on time and not have to worry at all. 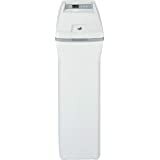 Unfortunately, there are not a lot of reviews out there on the GE line of water softeners for the home. The people that I did manage to find who owned one of these units only had good things to say about it. If you ask me, it seems safe to say that these systems are just as good as all the other appliances that GE sells. So, you can feel comfortable relying on their reputation as a quality home appliance company.